SKYNET is an international research network dedicated to aerosol—cloud—radiation interaction studies. It consists of about 60 sites located all over the world. The main instrument at each site is the sun—sky radiometer, but to strengthen the ability of SKYNET, simultaneous measurements with other instruments such as pyranometers, pirgeometers, microwave radiometers, absorption meters, cloud cameras, lidars, MAX-DOAS, and instrumentation for in situ characterisation are also conducted for some selected sites. This special issue will face issues related to the following topics: aerosol and cloud properties from radiometers; developments on instrumentation; aerosol radiative forcing and climate effects; intercomparison among radiometer networks; validation of aerosol and cloud properties from satellite and models; applications for air pollution studies; and applications for solar energy. In a companion paper, we investigated airmass exchanges from the Po plain to the Alps through detailed case studies. Here (part 2) we use 3 years of multi-sensor observations and models to quantify the long-term impact of transport on air quality (> 25 % on PM10) and aerosol physico-chemical characteristics. We quantify the frequency of occurrence (up to 70 % of days) in relation to meteorology (wind flows). We also show how the experimental results can improve air quality forecasting capabilities. 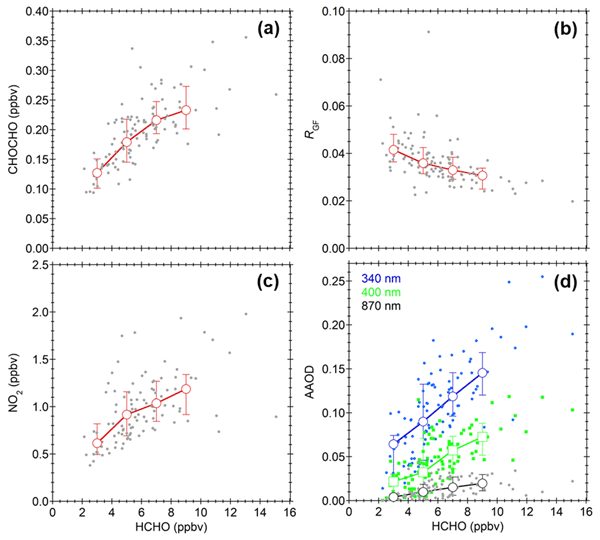 This study analyzed the aerosol optical properties derived by SKYRAD.pack versions 5.0 and 4.2 using the radiometer measurements over Qionghai and Yucheng in China, two new sites of SKYNET. 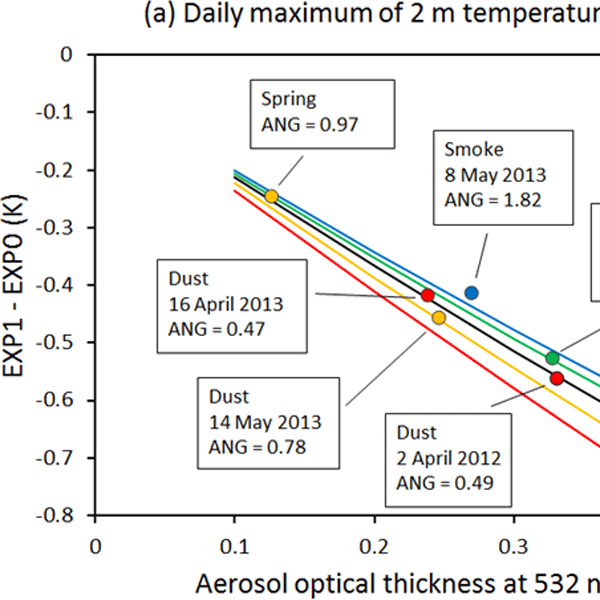 The seasonal variability of the aerosol properties over the two sites were investigated based on SKYRAD.pack V5.0. 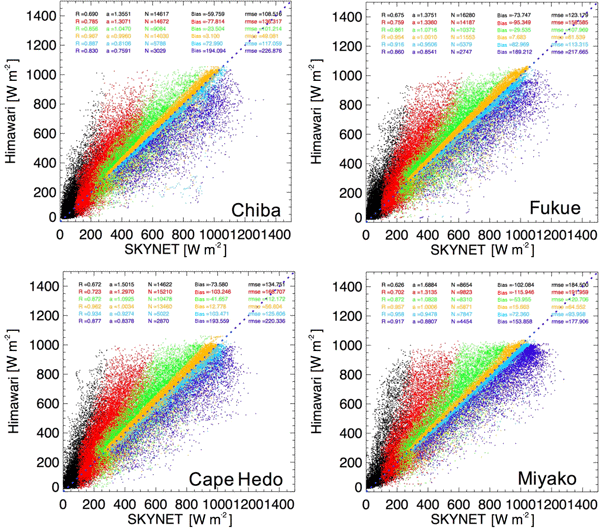 The results provide valuable references for continued improvement of the retrieval algorithms of SKYNET and other aerosol observational networks. 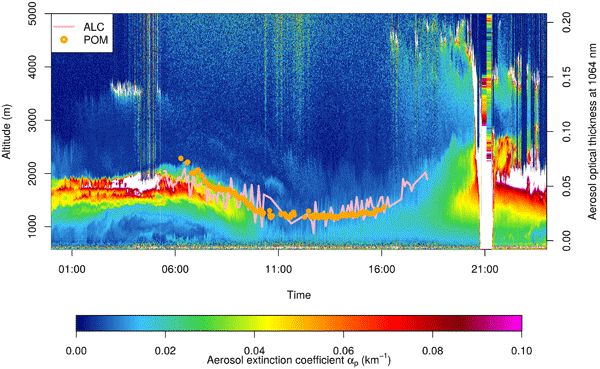 Atmospheric aerosols are an important constituent of the atmosphere. Measurement networks using radiometers such as SKYNET have been developed. There are two constants that we must determine. One of them is the solid view angle (SVA) of the radiometer. The problems related to SVA were investigated. It was shown that the conventional method can cause a systematic underestimation, and an improved method was proposed. Utilizing the results of this paper, SKYNET data will become more reliable. Atmospheric aerosols are an important constituent of the atmosphere. Measurement networks using radiometers such as SKYNET have been developed. There are two constants that we must determine to make accurate measurements. One of them is the calibration constant. The accuracy of the current method to determine this was investigated and the new method for water vapor and near-infrared channels was developed. Utilizing the results of this paper, SKYNET measurement data will become more reliable. The Tohoku Earthquake of March 2011 stressed the need for energy source diversity, and the governmental policy in Japan has been stimulating a broader use of renewable energy. Solar power is potentially able to mitigate climate change triggered by greenhouse gas emissions, but its instability caused by cloudiness is a critical issue for suppliers. To develop an appropriate control system, surface solar radiation data must be made available as accurately as possible. 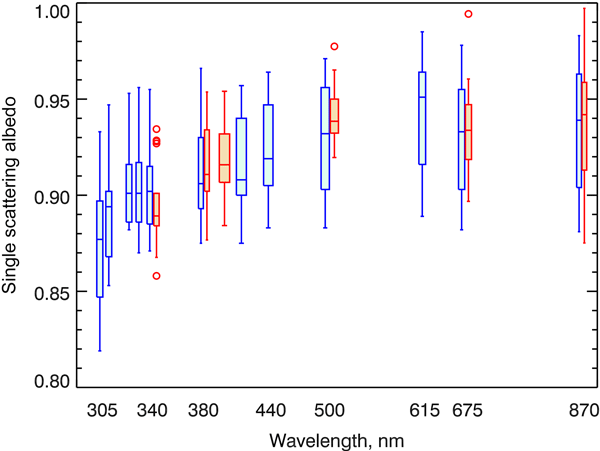 Measuring aerosol absorption from the shortest ultraviolet (UV) to the near-infrared (NIR) wavelengths is important for studies of climate, tropospheric photochemistry, human health, and agricultural productivity. 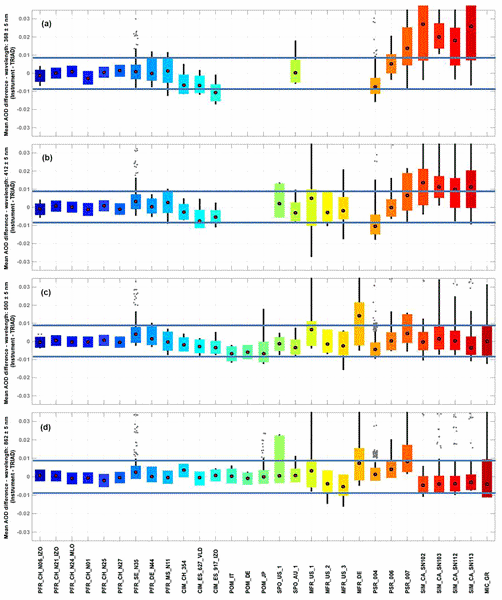 We estimate the accuracy and demonstrate consistency of aerosol absorption retrievals from different instruments, after accounting for spectrally varying surface albedo and gaseous absorption. The purpose of this work is to retrieve integrated water vapour using spectral measurements from Precision Solar Spectroradiometer (PSR). Two different approaches were developed one using single-channel direct sun irradiance measurements, and the second one integrating at a certain spectral region. The results of the spectral approach are closer to the retrievals of non-photometric techniques (GPS, microwave radiometer and radiosondes), suggesting this method provide more accurate IWV product. The estimation of precipitable water vapour (W) content is of great interest in both meteorological and climatological studies. Sun photometers allowed the development of W automatic estimations with high temporal resolution. A new methodology, based on the hypothesis that the calibration parameters characterizing the atmospheric transmittance are dependent on vertical profiles of temperature, air pressure and moisture typical of each measurement site, has been presented providing good results. 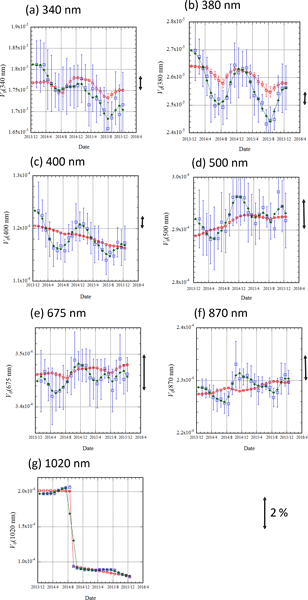 In this paper we evaluate the performance of two estimates of the global horizontal irradiance (GHI), one derived from the Meteosat Second Generation and one from a meteorological model (Regional Atmospheric Modeling System) forecast. The focus area is Italy, and the performance is evaluated for 12 pyranometers spanning a range of climate conditions, from Mediterranean maritime to Alpine. We have developed an instrument which can be deployed on ships in the remote oceans to measure optical properties of the atmosphere. These optical properties are key to understanding how light and heat are transmitted, absorbed and reflected within the atmosphere. This has consequences for how the wider climate system works. The oceans, covering 70 % of the planet, are chronically under-sampled for such optical properties. Such instruments, when widely deployed, should help rectify this problem.